Custom fonts, colors, buttons, and more! 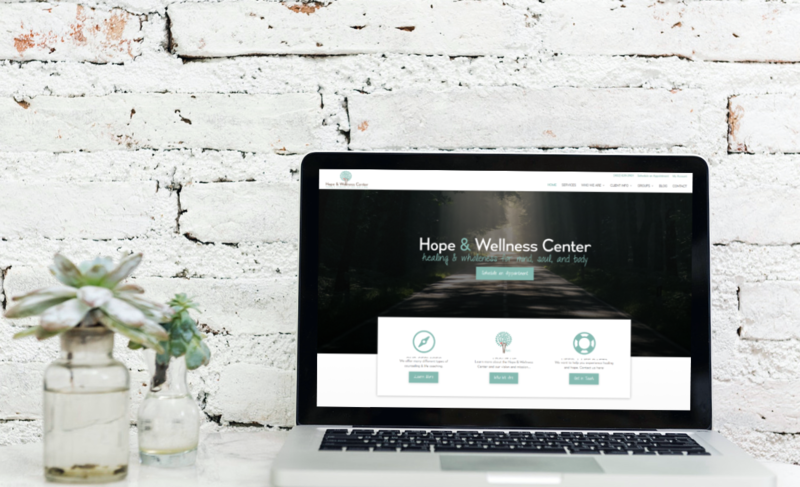 We updated Hope & Wellness Center’s website to be clean, inviting, and easy-to-navigate for their visitors and clients. 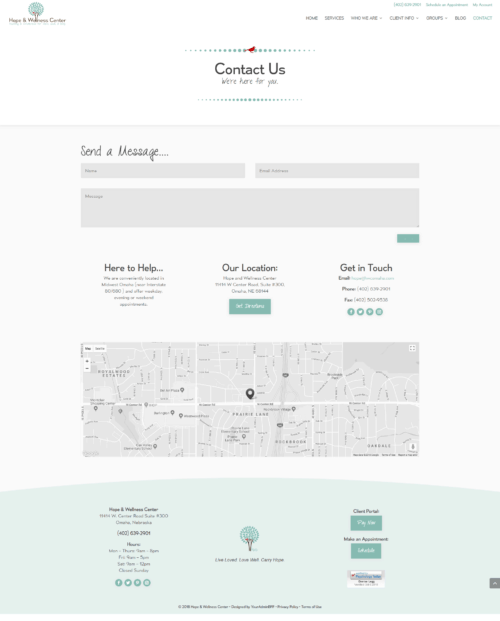 The site is mobile-responsive, with custom fonts, colors, buttons, and images. It’s also got meaningful quotes that match the branding of Hope and Wellness including throughout the site. The Hope & Wellness Center also hosts many groups and workshops on a frequent basis, and needed a way to organize them. They wanted a calendar to display them on, along with easy-to-find registration buttons for groups that were still open for registration. So we helped them set up a Tockify calendar for this purpose. We customized the styles and colors to match their site. Then, we built a calendar page for them, as well as an events section on their home page. And to make it even easier for visitors to find the events they’re looking for, we added sections to the group info pages which only display related upcoming groups. A Client Info section in the navigation menu makes it easy for clients to find important info. 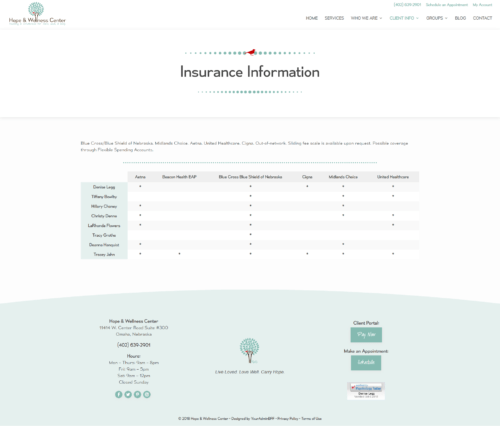 They can make a payment, download client forms, or review insurance information. 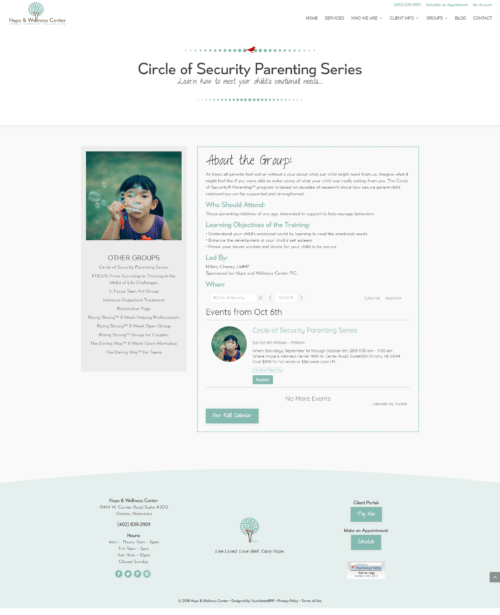 Our custom web design also included a team page, which makes it easy to learn about the Hope & Wellness team. Each team member has their own page, which displays their bio and interesting facts about them, as well as methods for contacting them directly. Since the blog is managed by multiple team members at Hope & Wellness, we wanting to make sure their posts were connected to each team member’s page. So we made sure to add an author bio section to the posts.. Each post also includes social sharing buttons on the side, making it easy for visitors to share or print the posts they love.